My dear and darling sister Josie just gave me a rather lovely compliment about my pie-baking abilities. While I will happily accept the praise, the real credit should go to my mum. When we were growing up, she spent several glorious months baking an apple pie a week, experimenting with different recipes and apple types until we unanimously declared that this was THE pie. The pie for all of your apple-iest desires. It is really quite wonderful. I think she found it in a Woman’s Day or Family Circle or other such magazine circa 1992. 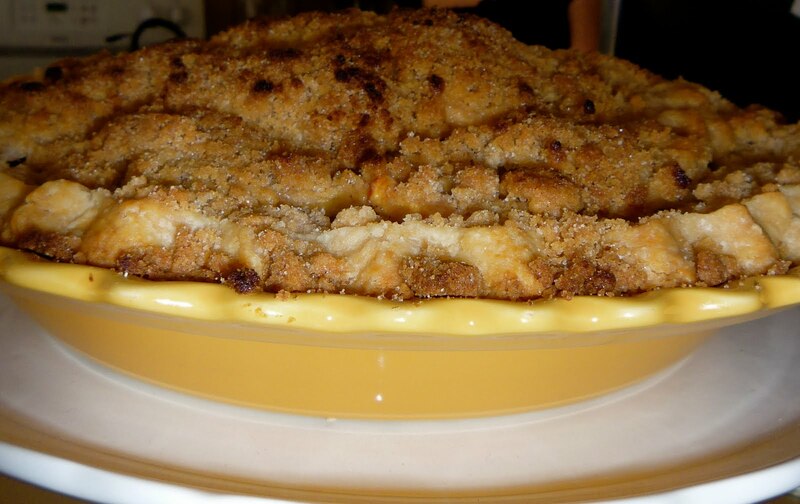 Whatever the source, I still have not encountered an apple pie that I like better, and so I wanted to share it with you! 2. To make the crumb topping, mix together the flour, sugars, and cinnamon in a medium-sized bowl. Use a pastry knife to cut in the butter until the mixture forms coarse crumbs. 3. To make the filling, peel, halve, and core the apples. Cut in 1/4 inch thick slices (I know that seems thin, but it works!) and place in a large bowl. Toss with the lemon juice. Mix the sugar, flour, cinnamon, and nutmeg in a small bowl, sprinkle over the apples and toss to coat. 4. Layer the apples in the pie shell, trying to make most of the slices lie flat, and mounding them higher in the center. Gently drop the crumble topping over the apples. 5. Bake the pie for 15 minutes, then reduce the oven temperature to 350 degrees and bake 45 minutes longer. I usually have to cover the pie with foil at some point after the first 15 minutes to keep the crumble for burning, so keep an eye on it. 1. Mix the flour, salt, and sugar in a medium bowl. Add the shortening and cut in with a pastry knife until the mixture has the texture of coarse sand. Scatter the butter pieces over the flour mixture and cut in with a pastry knife until the mixture is pale yellow and resembles coarse crumbs, with butter bits no larger than small peas. 2. Sprinkle 4 tablespoons of ice water over the mixture. With a rubber spatula, use a folding motion to mix. Press down on the dough with the broad side of the spatula until the dough sticks together, adding up to 1 tablespoon more ice water if the dough will not come together. Flatten the dough into a disk, wrap in plastic wrap and refrigerate at least 1 hour and up to 2 days before rolling. 3. Remove the dough from the refrigerator (if refrigerated more than 1 hour, let stand at room temperature until malleable). Roll the dough on a lightly floured surface into a 12-inch circle. Transfer the dough to a nine-inch pie plate and crimp the edges. Refrigerate while you assemble the rest of the pie components. Apple pies are my weakness! Along with hazelnuts, chocolate, sweet potato fries, and breakfast tacos. oh my god. give me this pie. also can we retest this experiment with you coming to our house and baking us an apple pie a week? lastly- we roasted broccoli for the first time tonight. it was amazing. i dont know how i have gone all this time without roasting broccoli before. ooh! then the next time you're in town i'll make you one! and a chocolate-hazelnut pie! and a sweet potato fry-breakfast taco pie! Yeah! This is a good recipe. I had no idea you were still using it. Thanks for giving me credit. I remember this recipe – in fact, I think I still have it! – from our apple picking trips. It is really an awesome recipe. It's been fun to read about your cooking and baking! thanks, julia! those trips were so. much. fun. i don't think i'll ever see anything prettier than that white church on a hill over the apple orchard in fall. it was so beautiful.